A multipurpose transformer has a secondary coil with several points at which a voltage can be extracted, giving outputs of 5.60, 12.0, and 480 V. (a) The input voltage is 240 V to a primary coil of 280 turns. What are the numbers of turns in the parts of the secondary used to produce the output voltages? (b) If the maximum input current is 5.00 A, what are the maximum output currents (each used alone)? This is College Physics Answers with Shaun Dychko. A multipurpose transformer can be adjusted so that it has different secondary voltages of 5.6 , 12 and 480 volts and it's going to be plugged into a wall socket at 240 volts, so that's the voltage of the primary. And The number of turns in the primary is 280 turns and so the question is how many turns need to be in the secondary in order to produce each of these voltages. So number of turns in the secondary divided by number of turns in the primary equals voltage of the secondary divided by voltage of the primary. This is the transformer equation and we can solve it for Ns by multiplying both sides by Np. So Ns equals Np over Vp times Vs. 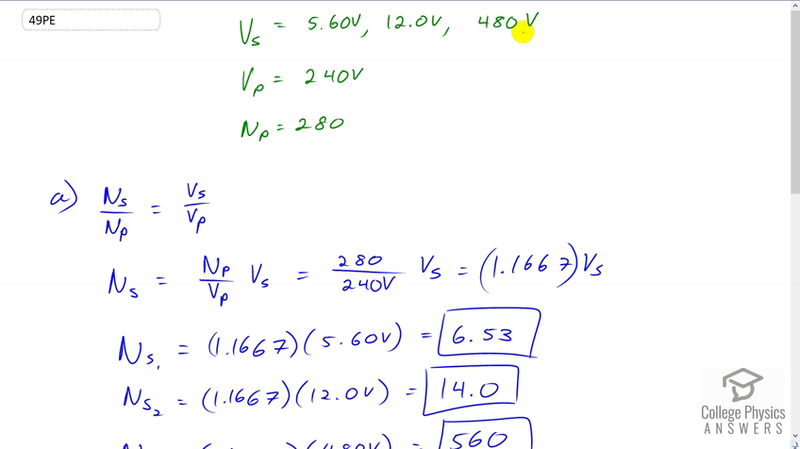 So that's 280 turns in the primary divided by 240 volts of the primary multiplied by Vs. And that is 1.1667 times Vs. And so this is a formula that we're going to use for each secondary voltage to calculate the number of turns in the secondary. So in the case of 5.6 volts in the secondary we have 6.53 turns and then for 12 volts in the secondary we need 14 turns and for 480 volts in the secondary we need 560 turns in secondary and then we're asked about current in the secondary. So the transformer equation for current is current in the secondary divided by current in the primary equals number of turns in the primary divided by number of turns in secondary and so we can multiply both sides by Ip to solve for Is and this works out to five amps in the primary times 280 turns in the primary divided by Ns. So that's 1400 divided by Ns. So, in the first case when we have when a 6.53 turns in the secondary for the 5.6 volts scenario in the secondary we have 214 amps and in the second case when there is 12 volts in the secondary in which case there are 14 turns we can substitute 14 for the number of turns in the secondary and we get 100 amps is the maximum possible current. And then when we have 480 volts in the secondary in which case we have 560 turns we end up with the maximum possible current of two and a half amps and there were you.